SUMMARY: Print. TV. Email. Text message. Social media. 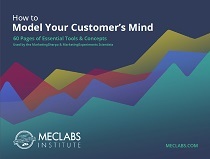 The amount of channels you can use to communicate with your customers has expanded and continues to grow. To help you communicate with your customers, MarketingSherpa commissioned a study last month and asked 2,057 American adults about their channel preferences. 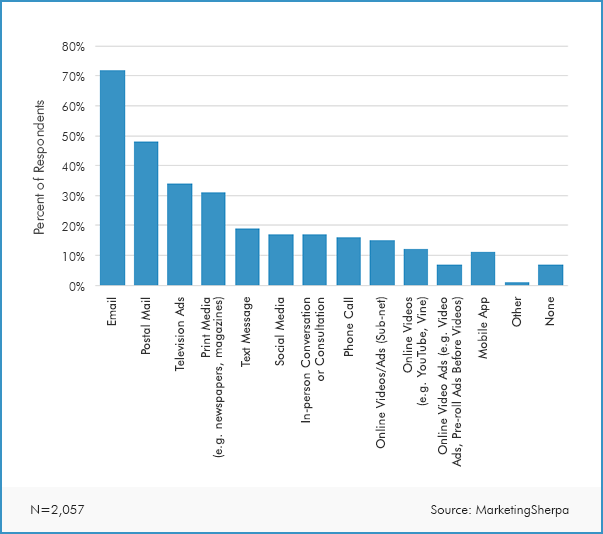 In this MarketingSherpa Chart of the Week, we share their responses. "It's not the tired email-is-dead 2003 world anymore. Junk mail didn't kill email the way most 'experts' expected. Instead, the struggle to stay afloat in an ocean of junk made permission emailers much, much stronger." And this was before the rise of the latest "threats" to email communication — Facebook, Twitter, smartphones and WhatsApp, etc. However, according to our latest research, email marketing could borrow from Mark Twain's famous quote, "The reports of my death have been greatly exaggerated." We discovered that a large majority of U.S. adults — 72% — prefer communication with companies to happen through email. Email was unique among digital channels. In fact, it was the only digital channel to outperform old media standbys — postal mail (preferred by 48%), television ads (preferred by 34%) and print media, such as magazines and newspapers, (preferred by 31%). For example, only 11% of people preferred mobile apps and just 7% preferred online video ads. There was, as you would expect, variations on channel preferences among different demographic groups. For example, 64% of those 55+ preferred postal mail, and 41% in that cohort preferred print media, while 38% of people ages 18-54 preferred postal mail, and 24% preferred print media. However, across almost every demographic surveyed, email was the preferred way to communicate with companies. The only exception was females 65 or older — 64% prefer email, and 65% prefer postal mail. Males aged 35-44 were the biggest fans — with 87% preferring email as their favorite channel.